1895: The United States Open is instituted. Willie Anderson is the first winner. Chicago Golf Club opens the United States' first 18-hole golf course. The pool cue is banned as a putter by the USGA. The U.S. Women's Amateur is instituted. Mrs. Charles S. Brown is the first winner. 1896: Harry Vardon wins his first British Open. 1897: The first NCAA championship is held. Louis Bayard Jr. is the champion. "Golf", America's first golfing magazine, is published for the first time. 1898: Freddie Tait, betting he could reach the Royal Cinque Ports G.C. clubhouse from the clubhouse at Royal St. George's - a three mile distance - in forty shots or less, puts his 32nd stroke through a window at the Cinque Ports club. The Haskell ball is designed and patented by Coburn Haskell. It is the first rubber-cored ball. The term "birdie" is coined at Atlantic C.C. from "a bird of a hole." 1899: The Western Open is first played at Glenview G.C., the first tournament in what would evolve into the PGA TOUR. 1900: Harry Vardon wins the U.S. Open, the first golfer to win both the British and U.S. Opens. Golf is placed on the Olympic calendar for the 2nd Games at Paris. 1901: Walter Travis becomes the first golfer, in the U.S. Amateur, to win a major title with the Haskell ball. When Sandy Herd wins the British Open and Laurie Auchterlonie the U.S. Open the next year with the Haskell, virtually all competitors switch to the new ball. Sunningdale, a course built amidst a cleared forest, opens for play. It is the first course with grass grown completely from seed. Previously, golf courses were routed through meadows, which frequently created drainage problems as the meadows were typically atop clay soil. The first course at the Carolina Hotel (later the Pinehurst Resort & CC) in Pinehurst, N.C., is completed by Donald Ross. Ross will go on to design 600 courses in his storied career as a golf course architect. 1902: England and Scotland inaugurate an Amateur Team competition, with Scotland winning at Hoylake. The first grooved-faced irons are invented. 1903: Oakmont C.C. is founded in Oakmont, Pennsylvania, designed by Henry Fownes. It is widely regarded as one of the finest examples of penal-style golf architecture. 1904: Walter J. Travis becomes the first American to win the British Amateur. 1905: Women golfers from Britain and the United States play an international match, with the British winning 6 matches to 1. "The Complete Golfer" by Harry Vardon is published. It promotes and demonstrates the Vardon or overlapping grip. 1906: Goodrich introduces a golf ball with a rubber core filled with compressed air. The "Pneu-matic" proves quite lively, but also prone to explode in warm weather, often in a golfer's pocket. The ball is eventually discontinued; at this time the Haskell ball achieves a dominance of the golf ball market. 1907: Arnaud Massey becomes the first golfer from the Continent to win the British Open. 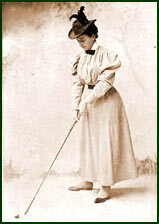 1908: Mrs. Gordon Robertson, at Princes Ladies GC, becomes the first female professional. "The Mystery of Golf" by Arnold Haultain is published. 1909: The USGA rules that caddies, caddymasters and greenkeepers over the age of sixteen are professional golfers. The ruling is later modified and eventually reversed in 1963. 1910: The R & A bans the center-shafted putter while the USGA keeps it legal - marking the beginning of a 42-year period with two official versions of The Rules of Golf. 1911: J.J. McDermott becomes the first native-born American to win the U.S. Open. At 17 years of age, he is also the youngest winner to date. 1912: John Ball wins his eighth British Amateur championship, a record not yet equalled. 1913: Francis Ouimet, age 20, becomes the first amateur to win the U.S. Open, defeating favorites Harry Vardon and Ted Ray in a play-off. The first professional international match is played between France and the United States at La Boulie, France. 1914: Formation of The Tokyo Club at Komozawa kicks off the Japanese golf boom. Harry Vardon wins his sixth British Open, a record to this day (Peter Thomson and Tom Watson have since won five Opens each). 1915: The British Open is discontinued for the duration of the First World War. 1916: The PGA of America is founded by 82 charter members and the PGA Championship is inaugurated. James Barnes is the first champion. The first course opens in Pinehurst, North Carolina. Francis Ouimet is banned from amateur play for his involvement with a sporting goods business. The ruling creates a stir of protest and is reversed in 1918. 1917: The PGA Championship and the U.S. Open are discontinued for the duration of the First World War. 1919: The R & A assumes control over the British Open and the British Amateur. Pebble Beach Golf Links opens as the Del Monte G.L. in Pebble Beach, California. 1920: The USGA founds its famed Green Section to conduct research on turfgrass. The first practice range is opened in Pinehurst, North Carolina. "The Professional Golfer of America" is first published which, today known as "PGA Magazine", is the oldest continually-published golf magazine in the United States.